Tired of spending all of your free time religiously cleaning your car’s interior to rid it of all the dust, dirt, and bacteria and also to ensure that the vehicle’s indoor air is fresh and up to snuff? Or dealing with the pains and aches that come after dragging and lifting heavy car seats, carpets and mats? Maintaining your car’s interior is more than a matter of pride, some dirt particles contain grit and other chemicals which can eat away the car interior’s surfaces. If you are looking for a hand vacuum cleaner that offers both remarkable performance and the latest features, then it may be time to consider the Black & Decker Pivot Vac 18V Cordless Pivoting Hand Vac PHV1810. This small portable vacuum boasts an innovative design and can reach up high, down low and into tight spaces. Moreover, its cyclonic action spins the dirt and dust away from the filter keeping the suction high at all times. The first interesting thing I noticed about this hand-held device is how it is shaped like an old school gym teacher’s whistle. The device isn’t heavy like some of the other brands and yet it doesn’t feel cheaply made. It is just as easy and fun to use as a new toy and certainly not tiring on your arm or hand. I, however, found its colors a bit dull compared to bright Black & Decker colors we are accustomed to. 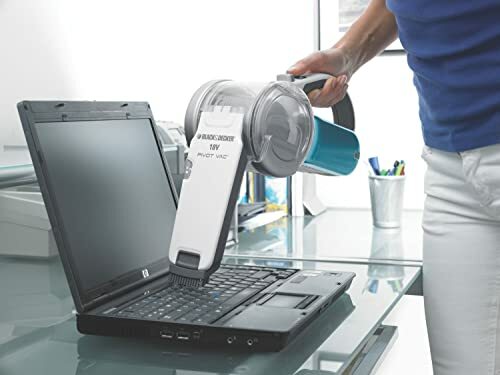 Moreover, the device is unique in that it quickly changes its very shape as you clean depending on the area being accessed. 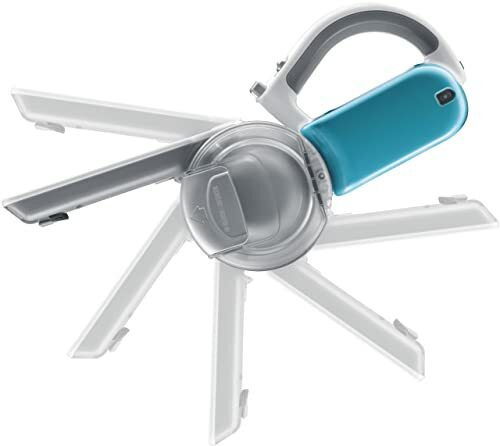 They call it the pivot because its head can be folded therefore reducing its storage footprint by almost a half. Convenient, right? It is also equipped with a brush tool and a crevice which is perfect for cleaning dust off your vehicle’s seats, mats and other surfaces like the dashboard. The PHV 1810 is considered the upgraded version of the PHV1800. Like most modern vacuums nowadays, the Black & Decker has chosen the route of integrating the needed accessories into the vacuum itself. This has proven to be highly convenient since most of these accessories easily get lost with time and this risk is eliminated. You can, therefore, flip down a brush from the device for dusting and cleaning delicate surfaces or you could similarly easily extend a crevice tool from the vacuum cleaner’s mouth to effortlessly get into automobile racks and furniture. Several features make the device one of the most favorable hand-held, battery powered vacuums available today. The Black & Decker works on 18volts. This is already a strong start for such a machine. The model has a cyclonic action which keeps the suction power strong. Speaking of suction power, the PVH1810 is rated at 35 watts. This certainly may not be the strongest power among hand-held vacuum devices, but given its asking price, then the power of this machine is good enough. The vacuum’s suction is spread over a wide mouth and is noticeably high. Given that many other hand-held devices require a small opening to have good suction, the Pivot Vac does not need to resort to that, and this makes cleaning much easier. The vacuum cleaner has an easy-to-access pivoting nozzle which is efficient in cleaning tricky corners and any tight spaces. This pivoting action can be set to over ten different positions useful for lifting debris and dust from a variety of angles. Moreover, it has a pleated filter system and a 3-stage filtration system which minimizes clogging and also improves the air exhaust. The pivot vacuum uses a conventional NiCad battery. The PHV1810 weighs about 3.9 pounds and is a bit on the heavier side. Before its first use, the battery should be left to charge for 24 hours straight. Ideally, most hand-held vacuums are designed for quick spot cleans rather than full on cleaning jobs. Its battery life is about 15-20 minutes which is enough time for cleaning a car interior. On this particular Vacuum, Black & Decker decided to go with the traditional paper filter and 3-stage foam. It may not particularly be the best, but it certainly does keep the cost down. 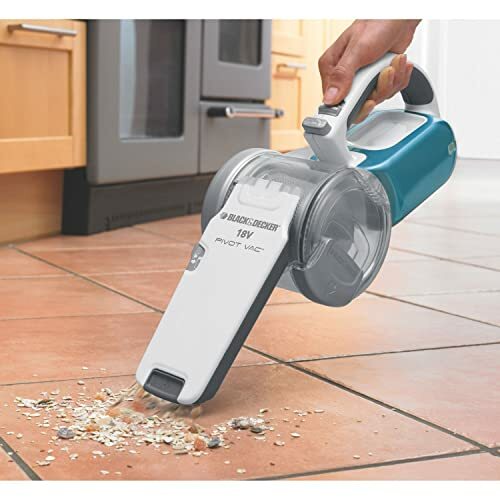 The hand vacuum also comes with a removable, washable dirt storage with a capacity of almost 16 ounces. The pivot is designed in such a manner that once you rotate the dustbin, it helps flick off the filter. Moreover, the translucent dirt bowl allows you to see when it is full and need emptying. The filters are washable but need to be replaced every six to nine months. The replacement filter for this model costs about $7. The hand-held vacuum comes with a two-year limited warranty against defects in workmanship and material which is par for the course for any cordless vacuums. Moreover, this extends a vote of confidence for the battery lasting that long. The good news is that you do not have to break into banks to purchase the PHV1810 to get the job done. Considering its unique pivot feature and strong suction power, the vacuum sells for just under Currently Not Available*. It has a long charging time, but this can be expected for all Ni-Cd batteries. The absence of a cradle charge like the one in the PHV1800 is also a negative point about this vacuum. The device is a bit heavy for a hand-held device. The noise level of the machine when working is also relatively high. It is a bit too loud for a portable vacuum. A messy car is a sure shame and it’s time to rid yourself of such unnecessary embarrassments. Despite some of the negative remarks about the Black & Decker hand-held Vacuum cleaner PHV1810, the machine possesses very many characteristics which are quite impressive. I would without any hesitation, recommend it to anyone in need of a handheld vacuum which is both powerful and versatile to the point of changing its shape in different situations and at a ridiculously affordable price. It is certainly worth it!